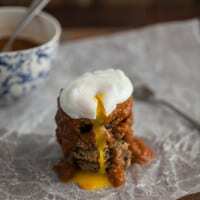 Quinoa Patties with Harissa and Poached Eggs | Naturally.Quinoa Patties with Harissa and Poached Eggs | Naturally. Preheat oven to 425° F and cover a baking tray with parchment paper. In a bowl, combine quinoa, bread crumbs, walnut meal, salt, pepper, garlic, paprika, and oregano. In a separate bowl, whisk the eggs. Pour the eggs into the brown rice mixture and stir until well combined. Let sit for 5 minutes. Wet your hands and scoop out mixture into roughly golf-ball size spheres. Compact the balls and place on the baking tray. Press down with the palm of your hand to form a patty, packing down any loose rice pieces. Continue with the rest of the mixture. Bake patties for 15 minutes, flip, and return to oven for another 10 to 15 minutes. Patties should be lightly golden and crisp on the outside. Serve brown rice patties with a spoonful of harissa and a poached egg.